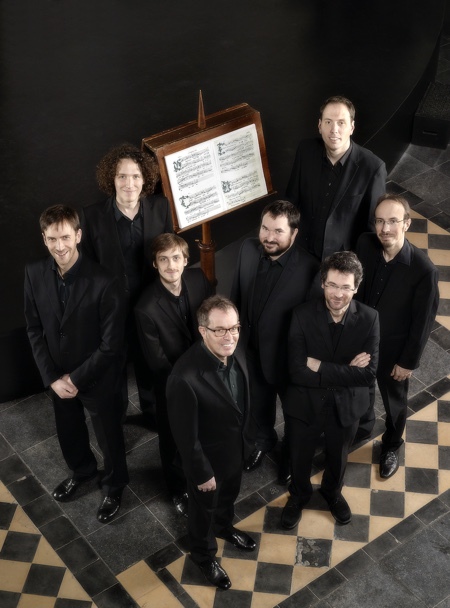 The Dutch ensemble Cappella Pratensis will make a five-city United States tour in November. Cappella Pratensis likes to buck convention. Or at least modern convention. 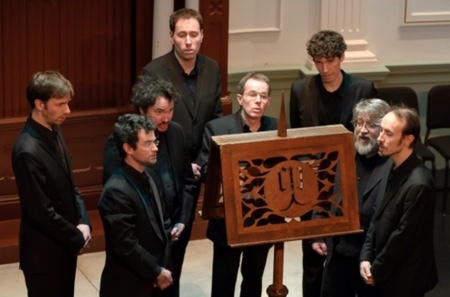 Instead of standing in a semi-circle with the singers holding their own songbooks like many choral groups do, the Dutch-based early-music ensemble’s eight members group themselves around one oversized book on an ornate music stand. Cappella Pratensis performing at a CD release concert. Among the ensemble’s stops will be the University of Chicago, where it will be making its third visit. Amy Iwano, executive director of University of Chicago Presents, was captivated by the singers’ unusual performance approach when she first heard them in 2012. The morning after Cappella Pratensis’ concert in the intimate 474-seat performance hall at the university’s Logan Center for the Arts, it will work with students in the school’s Early Music Ensemble. Cappella Pratensis was co-founded in 1987 by Rebecca Stewart, an ethnomusicologist and singer who became its first conductor. Pratensis, which means “of the fields,” is the Latin translation of the last name of Josquin des Prez, who is what Bull called the group’s “patron saint.” The French composer, who was born around 1450-55 and died in 1521, is considered the first master of the high Renaissance style of polyphonic vocal music. 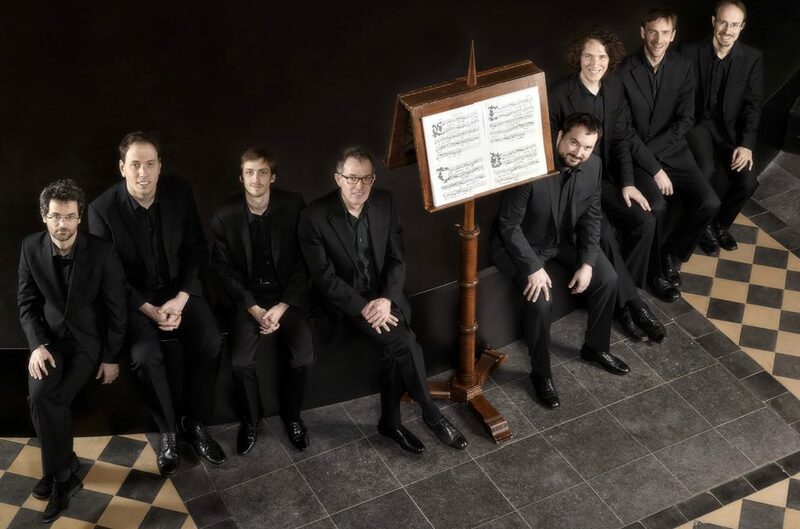 Bull believes the ensemble’s predominantly sacred repertoire from the Renaissance resonates with our time because it gives listeners a respite from the hurly-burly of contemporary life and offers a spiritual dimension without any direct connection to a religious institution. Cappella Pratensis in concert in Potsdam, Germany. The Canadian native joined Cappella Pratensis in 1988, became co-artistic director in 2004, and took over as sole artistic director four years later. As a student countertenor, he was drawn to The Hague’s rich early-music milieu and pursued studies at the city’s Royal Conservatory. He planned to focus on Baroque music but was soon taken with the Renaissance, learning to work from original sources and to bring a historically informed approach linguistically and stylistically to works of that era. Bull is particularly interested in the Duchy of Brabant, a state of the Holy Roman Empire established in 1183. That once-powerful region stretches across parts of present-day Belgium and Holland and includes such cities as Brussels and Antwerp. He serves on the staff of the Alamire Foundation, an international study center for music of the Low Countries in Leuven, Belgium, where he resides. 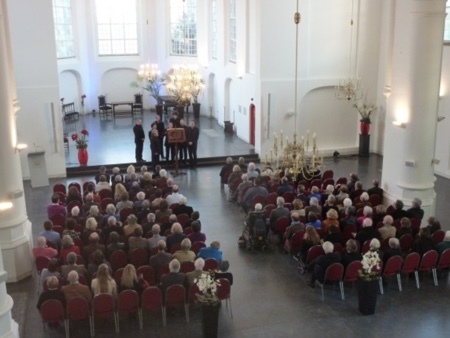 Cappella Pratensis is based just across the Dutch border in the town of ’s-Hertogenbosch. Both are situated within borders of the long-defunct duchy. The notes in the book are large enough to be seen from a distance, and they are presented in the fashion of the 15th and 16th centuries with no bar lines and the notes close together. In addition, each vocal line is notated separately, so that each singer can zero in on his part. In polyphony, the clarity of each musical line is critical, and this historical method of notation allows each singer to have a clear sense of the flow and contour of his part. And, yes, “his” is correct here. All of the members of Cappella Pratensis are men, because the group sings primarily liturgical music, which was originally sung entirely by men. Countertenors sing the top part. The group has done some programs of secular music, and it adds female singers as needed for those. Cappella Pratensis always presents thematic programs. “To me, it’s crucial,” Bull said. “There needs to be a story, something more than ‘This is wonderful music. You should listen to these nice pieces.’” Sometimes the group re-creates a Mass that was performed in a particular place or presents music that was sung for a specific event. But for this tour, it is going a different direction. The program, which consists primarily of art songs, is titled The Imitation Game: Emulation, Competition and Homage at the Time of Josquin. It explores a tendency in music of this period to borrow elements from earlier works and build on them in some way. The program was assembled by Peter de Laurentiis, an Italian musicologist and tenor who has performed with Cappella Pratensis since 2010. He also serves as an associate researcher at the Alamire Foundation and has developed other programs for the ensemble. De Laurentiis has long been interested in this subject; his master’s thesis examined composers that Pierre de la Rue, a noted Renaissance composer, imitated. Particularly influential on de Laurentiis was Howard Mayer Brown’s milestone article published in 1982, Emulation, Competition and Homage: Imitation and Theories of Imitation in the Renaissance. Brown, who died in 1993, was a professor of music at the University of Chicago, and de Laurentiis was delighted to learn that Cappella Pratensis will be performing on the Howard Mayer Brown International Early Music Series in Chicago. “That was a nice coincidence,” he said. Though many of the composers on the program, like Johannes Ockeghem, are hardly household names, they were major figures in their time and are well known in early-music circles. By far the most famous composer on The Imitation Game program is Josquin des Prez, who has a work featured in each of the musical groupings. Typical of the imitative groupings on the program is the fourth, which begins with des Prez’s Faulte d’Argent for five voices. In his version, Bull said, the writing is sparse, with abundant duets and clear contours. Adriaan Willaert (circa 1490-1562) reworked the earlier version, keeping the canon but adding another voice and enhancing its complexity, creating his own Faulte d’Argent in the process. The University of Chicago Presents’ Iwano admits with a chuckle that she does worry that Cappella Pretensis’ program might be a bit too esoteric or specialized for general audiences. But she had similar fears when she was new to her position and heard the group for the first time, and they proved groundless. “I was really surprised at how many people turned out,” she said. Nov. 10: Church of St. Mary the Virgin, New York, NY. For information, go here. Nov. 11: University of Chicago Presents, Chicago, IL. For information, go here. Nov. 15: Mississippi Academy of Ancient Music, Edwards, MS. For information, go here. Nov. 17: Getty Center, Los Angeles, CA. For information, go here. Nov. 18: St. James by-the-Sea Episcopal Church, La Jolla, CA. For information, go here.